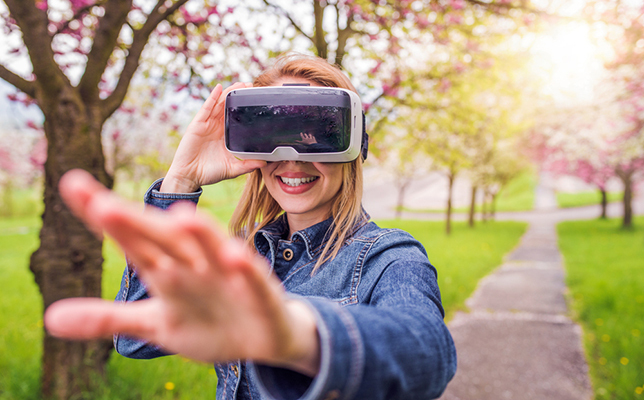 A new web program by Google allows users to explore the world in virtual reality (VR) by just speaking the name of a place. Speak to Go is activated by a user’s voice. When a user says the name of a place, Google Street View imagery pops up on one’s phone or web browser. For example, Richard Byrne, who writes the blog Free Technology for Teachers, recently spoke the word “Maine,” and was taken to Acadia National Park in Maine. Had he been more specific and said “Portland, Maine,” he would have seen imagery of Portland, he said. Speak to Go is designed to be used with smartphones inside of VR headsets, such as the Google Cardboard. However, it can also be used in the Chrome web browser if the user allows access to his/her microphone. The imagery isn’t as immersive in the web version as in the VR version, but it is still decent, Byrne said. Even in other browsers and without a VR headset, users can explore random locations in the world by clicking on “Try it without a headset” and tapping the space bar or the phone screen. A location pops up, and a 360-degree view is provided. Users can navigate perspectives either by clicking and dragging on a web browser or moving around with a phone. Clicking on arrows allows further mobility and exploration. Random locations include Niagara Falls, the Taj Mahal and Mont Blanc massif (mountain range) in France. In education, Speak to Go is a quick and easy option for exploring VR imagery without the need to touch a screen or click a command. In the web version, Speak to Go makes Street View imagery slightly more accessible to the average user. To try for yourself, visit the Speak to Go website.